SMYD3 knockout augments the effects of the MEK1/2 inhibitor Trametinib (GSK1120212) in vivo. Representative serial HE staining and IHC for pERK1/2, a marker of Ras activity, and MUC5, a marker of PanIN lesions. All scale bars, 50 um. Nature 2014 510(7504), 283-7. Trametinib (GSK1120212) purchased from Selleck. A101D and A101DBMR cells were treated with increasing concentrations of dabrafenib + trametinib (0 + 0 μM, 0.01 + 0.001 μM, 0.1 + 0.01 μM, 1 + 0.1 μM and 10 + 1 μM) for six hours and immunoblotted. Nature, 2017, 550(7675):270-274. Trametinib (GSK1120212) purchased from Selleck. Cell, 2018, 173(6):1413-1425. Trametinib (GSK1120212) purchased from Selleck. Immunofluorescence of E-cadherin, vimentin and DAPI in cells from grown on chamber slides and treated with 100 nM GSK1120212/trametinib. Scale bars represent 50 um. Cancer Discov 2014 4(2), 232-45. Trametinib (GSK1120212) purchased from Selleck. ERK phosphorylates FBW7 at T205. PANC-1 cells were pretreated with the proteasome inhibitor MG132 and trametinib, as indicated, overnight before harvest. Endogenous FBW7 phosphorylation status was examined by immunoblot analysis after immunoprecipitates (IP). Cell Res 2015 25(5), 561-73. Trametinib (GSK1120212) purchased from Selleck. MEK2C125S, but not the equivalent MEK1C121S variant, confers robust resistance to dabrafenib and trametinib. Transduced SKMel28 cells were seeded at low density and 24h after seeding were treated with the indicated concentrations of dabrafenib and trametinib every 72-96h. Colonies were stained with crystal violet 10 days post transduction. Photographs are representative of at least two independent transduction experiments. Nat Commun 2015 5, 5694. Trametinib (GSK1120212) purchased from Selleck. Ras, MEK and ERK control bronchial epithelial gene expression. Acute versus chronic GSK1120212. Acute (left panels): cells were seeded sparsely and incubated for 4 days in normal media and then subjected to a calcium switch and recovery, in the presence of DMSO (panel 1) or 500 nM GSK1120212 (panel 2). Chronic (right panels): cells were seeded sparsely and incubated for 4 days in DMSO (panel 3) or 500 nM GSK1120212 (panel 4). Cells were subjected to a calcium switch and recovery, in the presence of DMSO (panel 3) or 500 nM GSK1120212 (panel 4). Cells were fixed and stained for ZO-1 and DNA. Scale bar, 20 um. EMBO Rep 2015 16(1), 87-96. Trametinib (GSK1120212) purchased from Selleck. RDEA119 (1 uM) or JTP-74057 (0.1 uM) abolished the effects of G1 on DAPK1 and NR2B phosphorylation. The data were pooled from five independent experiments. J Neurosci 2012 32, 4887-900. Trametinib (GSK1120212) purchased from Selleck. Phosphorylation level of ERK1/2 and apoptosis after GSK1120212 exposure. Phosphorylation levels of ERK1/2 after GSK1120212 exposure. When the phosphorylation levels were examined after GSK1120212 exposure (0, 1, 3, 10, and 30 nM), the samples were collected 3 hours after the stimulation. GSK1120212 induced a significant decrease in the phosphorylation levels of ERK1/2 in the hypersensitive cell lines (OCUM-1 and Okajima), compared with that in the non-sensitive cell line (SNU-16). b-actin was used as an internal control. Mol Cancer Ther 2014 13(12), 3098-106. Trametinib (GSK1120212) purchased from Selleck. Dose response curve of compound on melanoma cell lines. Compound was dissolved in DMSO, added in a 5-fold dilution series, starting with 5μM, and incubated for 72 hours. Fluorescence was measured after 8 hours incubation in resazurin. Data was normalized to DMSO (maximal viability) and Doxorubicin (minimum viability). One customer. Trametinib (GSK1120212) purchased from Selleck. induced by GSK1120212b. (a) LOX IMVI melanoma cells were serum starved and treated with vemurafenib (0.3 μM), with GSK1120212b (GSK, 0.15 μ M) or with their combination in presence or not of anti-ErbB3 mAb A4 (20 μ g/ml) for 24 h. Western blot analysis shows that A4 mAb abrogate ErbB3 phosphotylation as well as the strong increase of pAKT induced by both inhibitors . For densitometric analysis pErbB3/ErbB3, pERK/ERK and pAKT/ATK values are expressed as fold change with respect to the control unstimulated cells to which value = 1 was assigned. Results are expressed as mean values from three independent experiments. (b) Cells were grown in the presence of different doses of GSK combinated or not with A4 mAb (20 μ g/ml) for 10 day. Cells were then dissolved in a Methanol/SDS solution and the adsorbance (595 nm) was read as above. Quantitative analysis for curve fitting and for IC50 evaluation, performed as above, shows that the treatment with A4 enhances the inhibitory effect of GSK on cell growth (IC50 GSK = 115 nM; IC50 GSK + A4 = 19 nM). p-values were calculated and significance level has been defined as above. For IC50 GSK + A4 p < 0,001 vs IC50 GSK. (c) Cells were treated with suboptimal doses of vemurafenib, GSK or their combination in presence or not of A4 mAb (c). The in vitro colony formation assay shows that the addition of A4 significantly inhibits cells growth. *p < 0,01 vs vem-treated or GSK-treated cells; ** p < 0,001 vs vem + GSK- treated cells; NS vs untreated cells. Trametinib (GSK1120212) purchased from Selleck. Mouse carcinoma cells were treated with the inhibitors for 16 and 40 h at the concentrations indicated. The effect on S-phase was evident at 16 hrs. (A) whereas apoptosis was induced at 40h. (B) Biological effects of the compounds correlated with effects on phosphorylation of the MEK target ERK. (C) IC50 on S-phase and ERK-posphorylation: TAK-733=1-10nM, GSK1120212=<1nM. Jonas Nilsson, PhD from University of Gothenburg. Trametinib (GSK1120212) purchased from Selleck. More potent than PD0325901 or AZD6244. Non-phosphorylated myelin basic protein (MBP) is coated onto an ELISA plate, and the active form of B-Raf/c-Raf is mixed with unphosphorylated MEK1/MEK2 and ERERK2 in 10 μM ATP and 12.5 mM MgCl2 containing MOPS buffer in the presence of various concentrations of GSK1120212. The phosphorylation of MBP is detected by the anti-phospho-MBP antibody. Method: Exponentially growing cells are precultured in 96-well tissue culture plates for 24 hours and then exposed to GSK1120212. Cell growth is determined by an in vitro toxicology assay kit, sulforhodamine B based. For apoptosis assay, both floating and adherent cells are collected and fixed with 70% ethanol. After washing with PBS, the cells are suspended in 100 μg/mL RNase and 25 μg/mL propidium iodide (PI) and incubated at 37 °C for 30 minutes in the dark. The DNA content of each single cell is determined using the flow cytometer Cytomics FC500 or Guava EasyCyte plus. Yamaguchi T, et al. Int J Oncol, 2011, 39(1), 23-31. Yamaguchi T, et al. Inflamm Res, 2012, 61(5), 445-454. Greger JG, et al. Mol Cancer Ther, 2012, 11(4), 909-920. Khalili JS, et al. Clin Cancer Res, 2012, 18(16), 4345-4355. Could you help us with the best way to prepare Trametinib for in vivo i.p. injections? S2673 can be dissovled in 4% DMSO/corn oil at 3 mg/ml clearly. How to solve the problem that this product didn't dissolve up to 10mM in DMSO at room temperature? The solution can be heated up to 50 degree to help dissolve. Besides, sonication (with a probe sonicator) also helped greatly. Selumetinib (AZD6244) : MEK1-selective, IC50=14 nM. 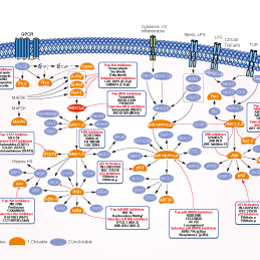 PD184352 (CI-1040) : Phase II for metastatic or unresectable breast, colon, pancreatic, or non-small cell lung cancer. Binimetinib (MEK162, ARRY-162, ARRY-438162) : Potent inhibitor of MEK1/2 with IC50 of 12 nM. 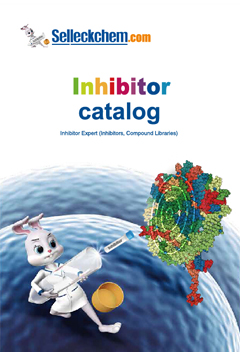 Refametinib (RDEA119, Bay 86-9766) is a potent, ATP non-competitive and highly selective inhibitor of MEK1 and MEK2 with IC50 of 19 nM and 47 nM, respectively.